A few months back my in-laws discovered a new barbecue place near us called Handsome Devil that happens to be inside the local ice rink. This past weekend we celebrated Father’s Day by heading back over there to get some food on Saturday. As we have in the past, we had a great time with wonderful food and a nice selection of beers on tap. We all started off with some fried pickles (forgot to photograph because I got so excited for one of my all-time favorite apps). The pickles themselves were nice and briny, but they also came with some sriracha mayo dipping sauce that was fiery and fun. I’m just recently discovered the wonder of sriracha, so this was auspicious timing. Better than the appetizer, though, was the meal I got. I wasn’t hungry enough to tackle my usual barbecue meal of “as much meat as I can stuff into my face,” so when I saw the Hot Mess on the menu, I was sold. 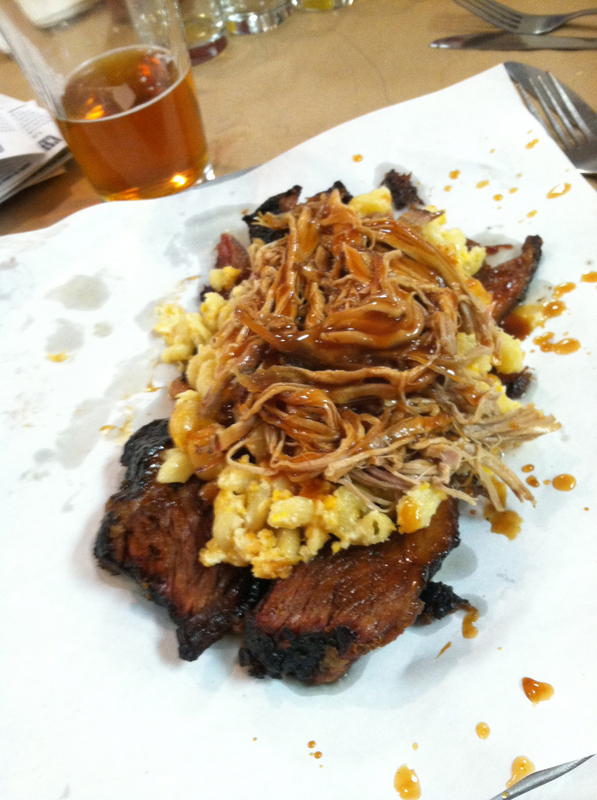 The dish has a layer of beef brisket topped with mac and cheese which has pulled pork on the very top. This was a great choice because you not only get the best side of all time — mac and cheese — but also a sampling of their brisket and pulled pork. Considering their food is so great, this is an easy sell for anyone looking to try a few different elements all in one big pile. My wife also had the Three Little Pigs smoked ham sliders which were just bonkers good. I was lucky enough to get one half of those little sandwiches and could have eaten about 10. The salty, smokey ham worked so well on the sweet bun and covered in Gruyere cheese. As an added bonus, Lu got to watch some hockey because there was a kids game going on and you can walk into the stands right from the rink. I bet they do a pretty great appetizer/beer business during those games.